Among the Zoltán Kodály Primary School’s choirs, the Cantemus Children’s Choir, a community of 12-15 years olds, contains the most members. They have been operating since 1974 under the leadership of Dénes Szabó. They have achieved a great deal of success in Hungary and abroad alike, and have also participated in international conferences on music pedagogy. Besides Hungary, they have given concerts in several countries of Europe and have also performed in Venezuela, Australia, Japan, Korea, Canada and the USA. They have won a number of awards at international contests. As an acknowledgement of their outstanding artistic achievements, the choir was awarded the prize of the „Foundation for Hungarian Arts” in 1989, and the Bartók Béla – Pásztory Ditta Prize in 1993. The Pro Musica Girl’s Choir was created in 1986, by those alumni of the Cantemus Children’s Choir who had left the choir but wished to carry on singing in this community. As early as the first year of its existence, the choir won first prize at the Bartók Béla International Choir Contest in Debrecen. They went on receiving prizes at similar events in Gorizia, Tolosa, Arezzo and Athens. Ten years later, in 1996, they won the most important award of international choir contests, the European Grand Prix in Debrecen. Miklós Kocsár, the highly respected composer of the Hungarian choral music. 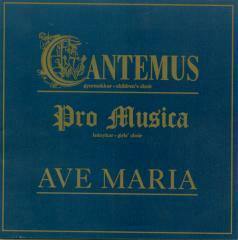 The composer’s palette of carefully selected high level poetic themes enriched itself with a new colour during the past decade after he „discovered’ how effective the content of the lyrics of Latin liturgies still is today and so since 1990 he has published a number of ecclesiastical choral pieces. Out of this new crop Dénes Szabó, Liszt- and Kossuth-Prize conductor, the expert interpreter of Kocsár’s vocal music and his choirs have made a valuable cross-cut, a CD recording. Dénes Szabó has selected 20 compositions of various age and character from the 16th century up to now, including several works by Hungarian composers. 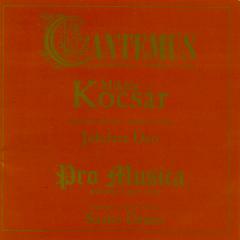 The memorable performance of the well known Cantemus Children’s Choir and the Pro Musica Girls Choir offers a unique experience to those who listen to the CD.